Oscar-Claude Monet was a founder of French Impressionist painting. The term "Impressionism" is derived from the title of his painting Impression, soleil levant, (Impression, Sunrise). Impressionist painters tended to paint most of their paintings outdoors and liked to portray subjects in nature like trees, fields, and oceans. The style was called impressionism because the artists didn’t feel they had to present a realistic picture. Instead, they used short brush strokes and applied thick layers of paint to create the idea, or the “impression”, of a subject. Born in 1840 in Paris, his parents moved the family to Normandy in 1845. His mother was a singer, and his father, a grocer, wanted him to go into the family business. Monet had other plans…he wanted to become an artist. When he was around 10 years old, he started selling charcoal caricatures (exaggerated pictures of people) for 10 to 20 francs a piece. Pretty good for a 10 year old! His mother died when he was around 17 years old, and he moved to Paris to study at the Acadamie Suisse. He was only there for a year before he was drafted into the army. He came down with typhoid fever and was in the army a few years before he was able to come back home. 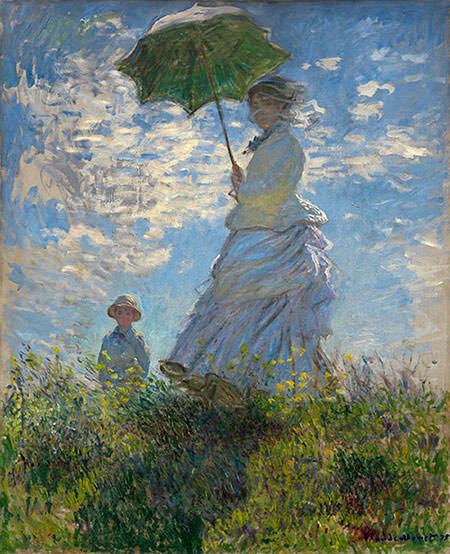 Claude Monet, now married to a lady named Camille, moved to London in 1870 when war broke out in Paris. He painted several paintings of Camille and the couple had two sons together, Jean and Michel. During this time, he became friends with several other artists - Pierre Renoir, Edouard Manet, and Camille Pissarro. This quartet of talented artists formed the Society of Anonymous Painters, Sculptors, and Printers. Their first art exhibition wasn’t loved by the critics. This was where the term “Impressionism” was coined. It was meant as an insult to the artists. The critics were saying that their art wasn’t a real reflection of the world, just an “impression” of it. The artists carried on with their new type of art. They were trying to create art in a new way, after all! Monet eventually became the most famous artist in France. He is considered one of the most influential and loved artists of all time.